Have you ever wanted a world with more water and less land, well now you can have one. This mod adds a world type where the amount of landmass above water is decreased. This mod works with extrabiomesXL, however, some biomes may cause islands that are far larger than vanilla. Tweaking some of the noise settings may alter this to be less the case, but could cause biomes to become more extreme hill like. At the moment there are issues with some villages, and certain mods generation, causing them to generate underwater completely. This could be the key mod in a modpack of the Forever Stranded style, or just a fun Let's play world. I like it. Does it work with any biomes mod? 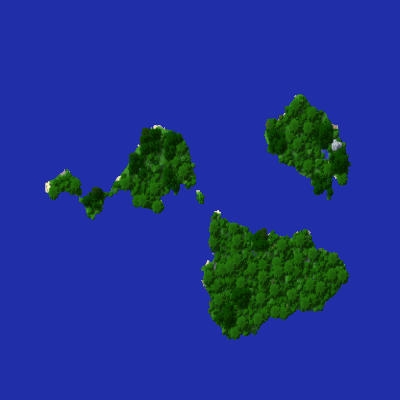 I am currently using Climate Control to generate more islands and less continental world however it doesn't support custom biomes other than BOP. Currently It has been confirmed to work with ExtraBiomesXl. Biomes O' Plenty isn't directly supported at the moment, but will probably be in the future with a separate world type. How about Traverse? I don't personally use Biomes OP. Just use either Extra Biomes or Traverse. Thank you BTW! Edit: Also can you add an option to set the Island world type as the default world type on the config? Traverse appears to be 1.11.2 and up, while this mod is for 1.7.10. Config will be added in the next version of the mod.